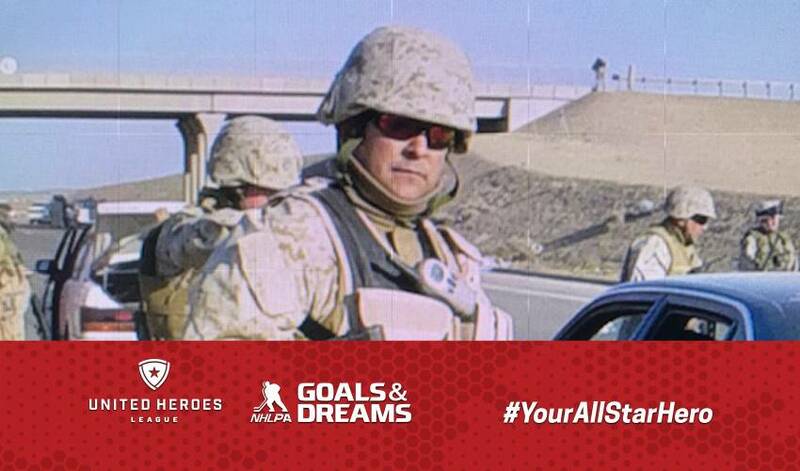 This is the first of a four-part series highlighting the NHLPA and UHL 2018-19 All-Star Hero campaign, which through the NHLPA Goals & Dreams fund, recognizes military personnel and their families for their services. Today’s story spotlights Sergeant Richard Silva of the United States Marine Corps. Burns, along with Shane Hudella, founder/president of United Heroes League (UHL) teamed up to deliver good news to Silva – he was one of the four service members headed to the 2019 All-Star Weekend in San Jose through the All-Star Hero campaign. It proved to be a bit trickier of a task than expected. With Sgt. Silva at the head of the wheel en route from their Chula Vista, California, home to Arizona, the family was headed to a hockey tournament for his son, RJ. With little time to spare, pulling over wasn’t exactly high on the priority list for dad. Maura, up against an unrelenting father determined to reach their destination in a timely fashion, did what she had to do – she feigned a medical emergency forcing him to pull over for a stop. Burns and Hudella cleared the air quickly when Sgt. Silva dialed the phone expecting to hear a doctor on the other end, with Hudella confessing everybody was okay and explaining the campaign background. As it turns out, he was already familiar with Brent – and his family too. Sgt. Silva previously met Susan Burns, Brent’s wife, as a guest for a game in the suite that the Burns’ provide to military families at Sharks home games throughout the season. An emotional Sgt. Silva was initially lost for words. In January 2001, Sgt. Richard Silva enlisted in the United States Marine Corps and graduated as an armorer in January of 2001. Three years later, he deployed to Fallujah, Iraq, where he served with the Marine Recon Unit. For several months, Sgt. Silva and his men found themselves in the midst of heavy combat, enduring severe weather conditions and constant attack from enemy forces. Despite the countless dangers they faced, the unit were unwavering in adhering to their mission. On July 30, 2004, Silva and his men, driving in a Humvee, encountered an Improvised Explosive Device (IED), which took the life of Lance Corporal Aguilar. Private First Class Geoffrey Perez lost his life August 15, yet Sgt. Silva has said that his own life was saved by PFC Perez’s heroic efforts on multiple occasions throughout their tour together. Two days later, Silva and Corporal Powers were attacked by mortar and Rocket-Propelled Grenades, along with heavy enemy fire. Corporal Powers was killed in combat, while Silva was left critically wounded from the shrapnel of the rockets and blasts that landed perilously close to him. Silva, the lone survivor of his unit, was medically evacuated and returned home after remaining by the sides of his dying comrades, offering comfort and all remaining morphine through their final moments. Four years later in April of 2008, Sgt. Silva was medically retired and is the recipient of a Purple Heart and Bronze Star with Valor. In having the kind of conversation only those who serve do, PFC Perez and Sgt. Silva had once made a pact, be it something neither one hoped to have happen. They agreed to honour each other’s comradery and sacrifice by naming their own son after the other in the event one of the men didn’t make it back. Soon after his return from deployment, Richard Perez Silva, Jr. (RJ for short) was born, named in tribute and honouring the unselfish act of his friend and fellow Marine. Sgt. Silva, along with his wife Carmen, have four children – Maura, Sarah, RJ and Urijah. Silva’s faithful service dog, Charlie, completes his family. You can follow Sgt. Silva's story and 2019 NHL All-Star experience on social media by following @NHLPA on Twitter or Instagram, and tracking #YourAllStarHero. What she thought he'd be, what she's learned from him, and the gift only a mother would love most in this week's special edition Player Q&A with Gaby Burns, mother of Brent Burns (who also calls him Burnzie! ).